Nigerian sprinter, Blessing Okagbare beat record breaking star, Usain Bolt, to the 2016 Guinness world records feat as the athlete with the most diamond league appearances. Okagbare participated in a 38 diamond league events higher than any other athlete in the world, according to the records. “Multi-discipline athlete, Blessing Okagbare from Nigeria participated at 38 Diamond league events between July 3, 2010 and September 5, 2014. 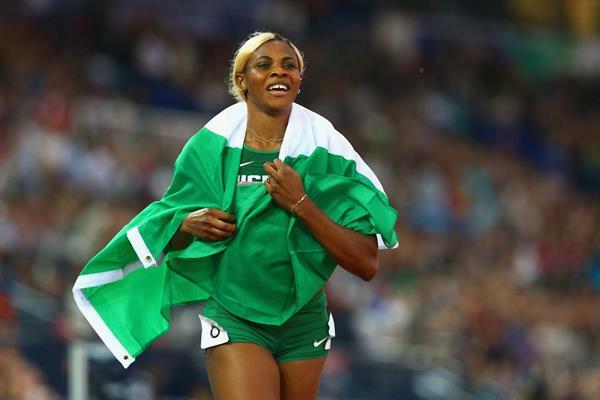 Okagbare’s specialities are the 100m and 200m sprints and long jump,” the book said. The IAAF Diamond League is an annual series of track and field meetings held from 2010 till date and billed to hold again in London by 2016. The competition was designed to replace the IAAF Golden League, which held from 1998 to 2010. Though Bolt was awarded IAAF world athlete of the year in 2008, 2009, 2011, 2012 and 2013, he is yet t to have as much appearances as the multi-talented Nigerian. Okagbare holds the women’s 100 metres Commonwealth Games record for the fastest time at 10.85 seconds.